The Chronicle of Higher Ed featured an article this week about CSU Dominguez Hills that showcases an example of an institution embracing assistive technologies like kurzweil, which translates students' reading material into audio content for a listening option. However, instead of utilizing kurzweil specifically for students with disabilities, as has been the tradition in education, we are now beginning to see the benefits of offering such services to all students as a learning resource. For years, I've built my own online courses with the option for my students to read or listen to my lectures. Imagine the difference here -- while kurzweil is terrific, as it converts a text-based article into a voice, it's a mechanical voice. What if students were given the option to read a lecture or an article in a professor's voice with her or his passion and inflection in full force? How different would that be for her learning experience? Aren't these the questions we should be posing here? Wouldn't this be enriching our students' learning and be honing in on issues of retention, success and increased learning? I think so. When teaching online in the fall of 2008, I surveyed two of my online classes. 87 students responded which was an 87% response rate. Here are a few interesting things I learned. 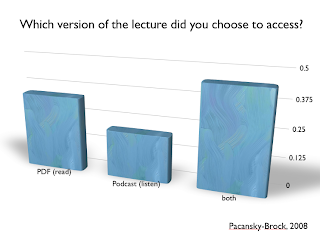 I was anxious to know whether or not my students actually used the audio option for the lectures -- I realize in college they were used to reading and, perhaps, they'd simply revert to what they were accustomed to. I was also teaching at an underfunded community college and had absolutely no instructional support so 100% of the podcast development was on my own shoulders (an issue that should not fall through the cracks here, especially since the majority of online enrollments in the US are blossoming in our community college districts per the Sloan-C annual surveys). This image reveals that 34% of students elected to read the PDF, while 21% listened to the podcast version of the lectures and 45% of students chose to do both. I honestly hadn't even thought to myself that students would choose to listen and read the lectures but I had begun to notice these comments flow in to me from students in the form of emails quickly after I begun to offer the lectures in both formats and it floored me. When I deployed this survey to my students, this was the result that stunned me more than anything else. And I surveyed another class of students the next semester and the results were actually very similar. When I asked students why they listened to and read the lectures, they simply responded "because it helps me learn." Wow. Imagine that. And here we are, struggling, endlessly, pouring billions of dollars into our educational system trying to figure out what we need to do to help our students learn. Maybe this isn't so hard. The ability to listen to the podcast over and over and hear my voice stress particular elements of the content was important to my students -- this is an element the text version of a lecture won't convey to an online student and it's something kurzweil won't offer to a student either. The professor needs to be present in a students' learning to be able to stress certain key elements of content and, of course, convey passion. A mechanical voice will never be able to do that. Finally, when my students were asked "Having the ability to read or listen to the lecture increases my ability to achieve the learning objectives," 96% of my students either strongly agreed or agreed. Perhaps we should consider investing some funding in supporting a personal approach to online teaching within higher education? Let's break out those microphones, folks, and give our students a choice in how they learn! This seems like such a basic concept to me and one we should have been implementing into learning (face-to-face and online) long ago. Audacity is a free recording software and microphones cost under $30. This isn't an expensive project. Training is simple. What's the hold up? Let's do this thing. I'm with you there. I plan to start augmenting my in-class lectures with short video segments -- mostly how-to's illustrating a specific technique or skill. My institution provides a studio for audio and video production. (I don't know why I anonymize it; everyone knows where I work.) Yet the studio is under threat of closure due to disuse. Is no one jumping on the record-your-lectures bandwagon? Or do online educators prefer to make their content in the comfort of their own home? I'm in the latter camp -- I am outfitting a spare room with the equipment needed to make videos. But I'm comfortable behind the camera and posses the technical skills to pull it off. Few other teachers could say the same. I think a lot of students could benefit simply from the teacher creating an audio podcast of the relevant material. Even though the tools for creating them are very inexpensive, there's still a technical learning curve. What we need is a dirt-simple website or application anyone can use to make an audio recording. Just type up a brief description, press record, talk, and the recording is automatically compressed, uploaded, and made available. Maybe Jing is the answer? I find myself in a position of trying to strike a balance between the videos and lecture. The videos ought to cover the basics; in-class lecture should be for answering questions and finding out where students are having difficulty. But I don't want to provide so much in the videos that the students feel they don't need to come to class. Did you find that students skipped class if the lectures were provided in advance?